Closing connections is possible by cancelling the incoming connection Flow from your server logic (e.g. by connecting its downstream to a Sink.cancelled and its upstream to a Source.empty). It is also possible to shut down the server’s socket by cancelling the IncomingConnection source connections. In this example both client and server may need to close the stream based on a parsed command - BYE in the case of the server, and q in the case of the client. 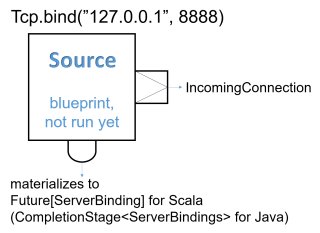 This is implemented by taking from the stream until q and and concatenating a Source with a single BYE element which will then be sent after the original source completed.